Rosalie Ungar is the author of IN A HEARTBEAT: The Ups & Downs of Life with Atrial Fib. My husband, Ed, was diagnosed with atrial fib just over a month ago. At 82 he is extremely fortunate not to have any chronic problems for which he needs medication and he takes only one prescription med, a water pill for slightly elevated blood pressure. His weight is perfect and he exercises 3 or 4 times a week. We eat a healthy diet, though I eat more vegetables than he does. His only inpatient stay in a hospital was in 1941 when he had his tonsils removed. Now he is dealing with a problem that I had for 35 years, but which I have not had since my cardiac ablation 11 years ago. You can read about it in my memoir IN A HEARTBEAT: The Ups and Downs of Life with Atrial Fib. Ed’s heart arrhythmia was discovered during a routine checkup by his internist who immediately recommended that he get an echocardiogram and referred him to an electrophysiologist. An echocardiogram or echo is a test that uses high frequency sound waves (ultrasound) to make pictures of your heart. Also called echocardiography, it shows the size, structure and movement of various parts of the heart. A blood thinner was started to protect Ed in case of stroke. Most A-fib patients are on one. I was on warfarin for 12 years, but not anymore since no longer having A-fib. Ed is wearing a monitor for 30 days taped to his chest where the data on heart activity is recorded and goes to a data center, notifying his doctor if problems occur. The doctor then gets in touch with Ed. This has happened twice. Both times, he was informed that he was in atrial fib. After the 30 days of monitoring, Ed has to take a home sleep apnea test. That’s coming up. Following the sleep apnea test Ed will go through a 4 hour stress test. Once all this is completed, a plan of action will be created. Ed is experienced. He has gone through all of this with me. His attitude is good and he is knowledgeable about the treatment and medication and knows that preventing a stroke is key. Other than that, atrial fib is not a death sentence…and neither is a stroke if precautions are taken. However, an adjustment to one’s daily habits may be necessary. Can do! Even Ed who’s never had a serious illness in his life. Attitude is everything. 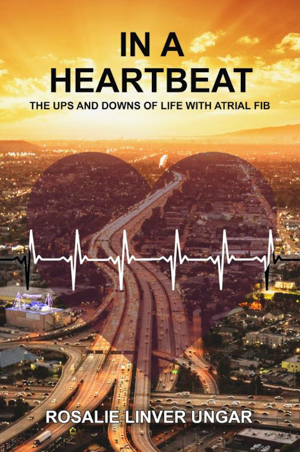 Read more about life with atrial fib in my memoir IN A HEARTBEAT: The Ups and Downs of Life with Atrial Fib. Click on the icons below for your paperback, or electronic read or audiobook. This entry was posted in Blog on October 14, 2018 by Mark Layman.